Which Approved Parenting Plan Form is Right For You? A Parenting Plan is required in all cases involving time-sharing with a minor child, even when time-sharing is not in dispute. This legally establishes the conditions and circumstances for time sharing. Establishing a visitation schedule is the main purpose of a parenting plan. A parenting plan can also establish custody, visitation, and decision making authority regarding the children as it pertains to time sharing and living arrangements. 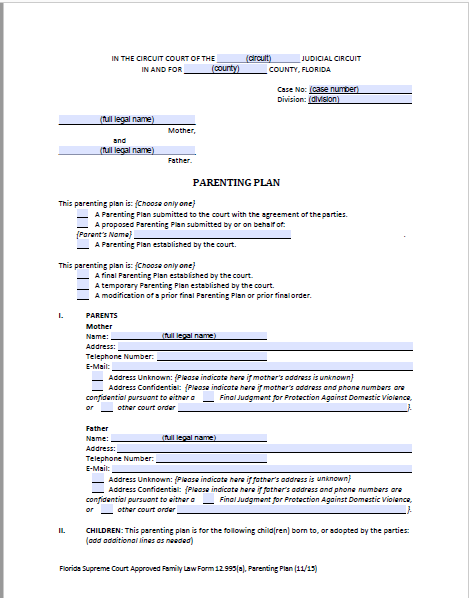 The following parenting plan form or a similar form should be used in the development of a Parenting Plan. After completing this form, you should file the original with the clerk of the circuit court in the county where the petition was filed and keep a copy for your records. If an agreed Parenting Plan is not filed by the parties, the Court shall establish a Plan. Shared Parenting Plan Instructions for Florida Shared Parenting Plan. Free download of forms and instructions for Florida divorce, child custody, and visitation cases. This parenting plan form or a similar form should be used in cases when you feel your children cannot be safely alone with the other parent or if you believe shared parental responsibility presents a detriment to the children. In this case, a Parenting Plan must be developed that allows time-sharing with any minor children, while providing protection for the children. This Parenting Plan form should be typed or printed in black ink. If an Agreement has been reached, both parties must sign the Parenting Plan and have their signatures witnessed by a notary public or deputy clerk. If an agreed Parenting Plan form is not filed by the parties, the Court shall establish a Plan. Supervised Parenting Plan Instructions for Florida Supervised Safety Focused Parenting Plan. 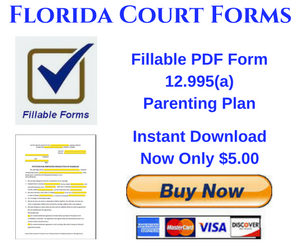 Free download of forms and instructions for Florida divorce, child custody, and visitation cases. at the time of filing the pending action to either establish or modify time-sharing planning to relocate your or the children’s principal residence more than 50 miles from the principal place of residence.